Hi there it’s Natalie from Fern & Maple here today. 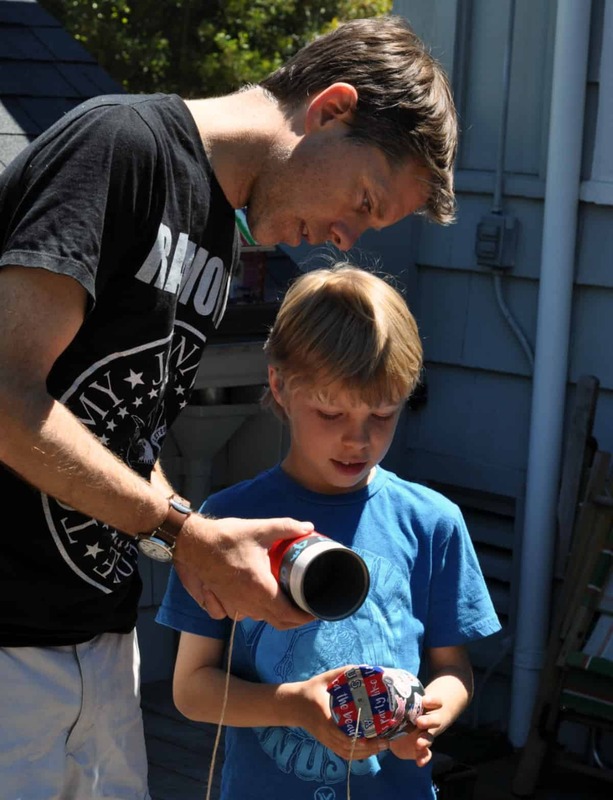 A big thank you to Skip To My Lou for inviting me to be a part of their fun summer series! 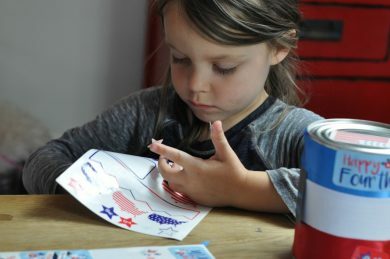 This is my first time joining and I’ve had a lot of family fun pulling together this post for you. 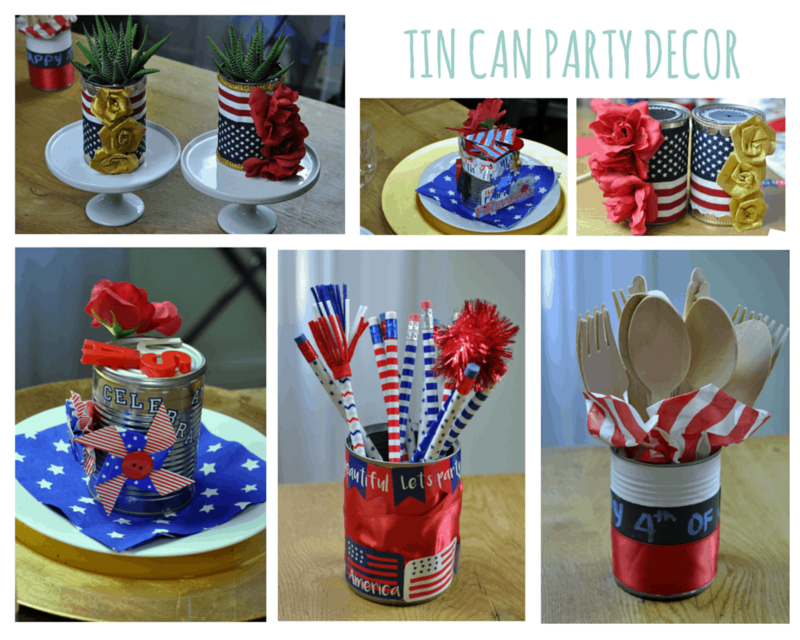 I enjoy sharing fun party ideas, DIY, crafts and more so pop on over for a visit! 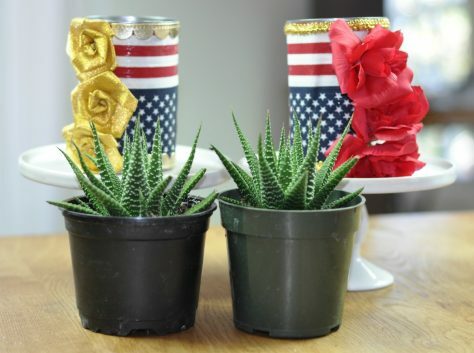 Well, let’s talk 4th of July! 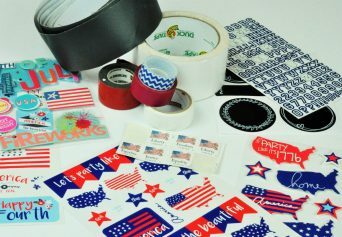 It’s coming up quickly and you may already be in the midst of trying to get things ready for family celebrations. 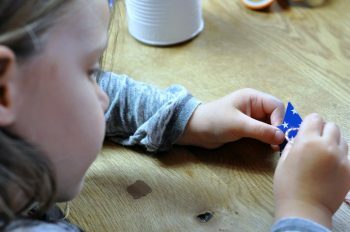 So why not let the kids help you this year? If they are anything like my 2, there will be one who loves to help and another who needs to be tricked into it! 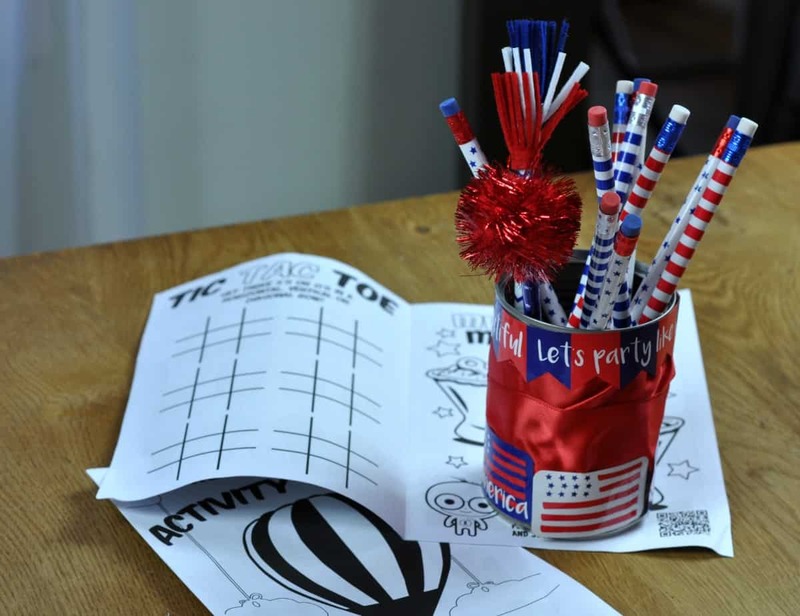 I have a few cute and easy projects the kids can help you with to decorate the table AND they can even make their own activities to keep them busy on the day. 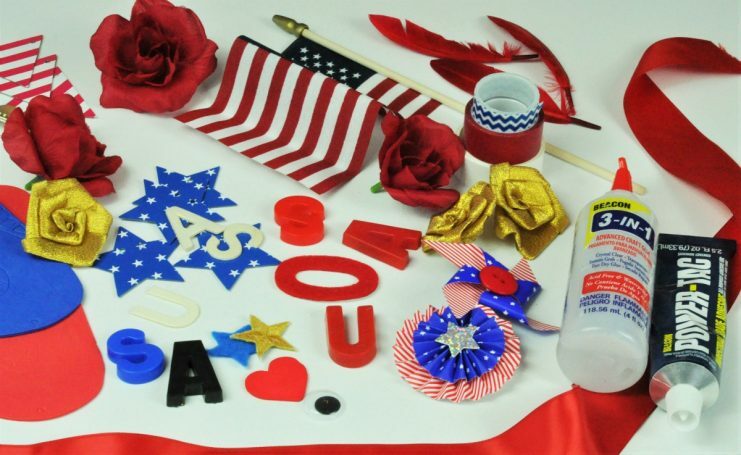 Crafting tools; for example: paint brushes, markers, sharpies, chalk pens etc. 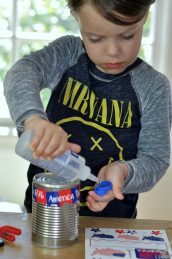 First let’s have the kids help decorate the table – they can use the cans to make everything from potted plants to cutlery holders. 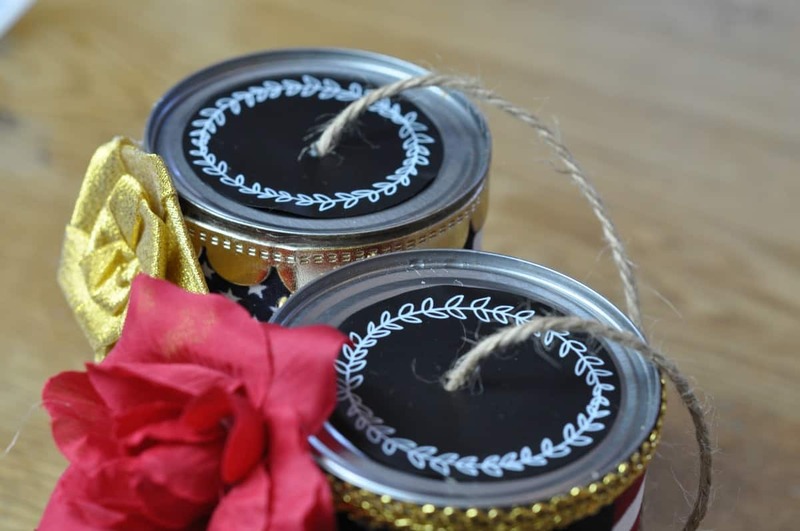 Step 1: Ensure the tin cans are empty, clean and the outer paper layer and top lid are removed. 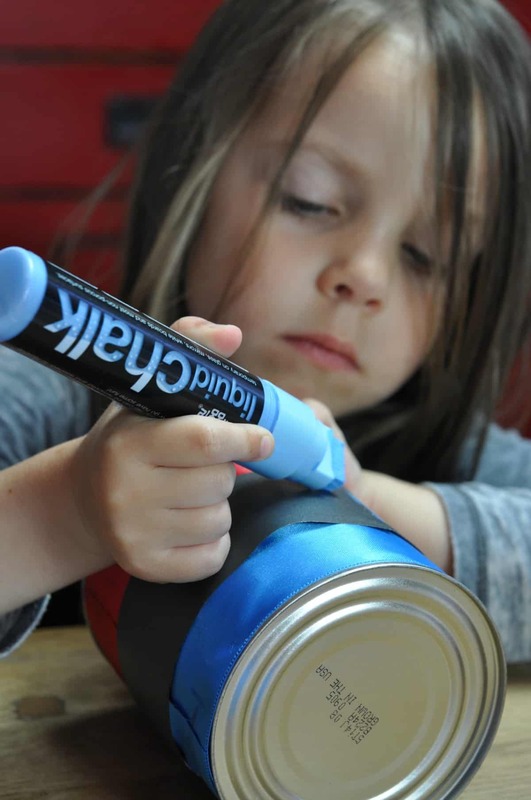 Step 2: Let their imaginations go wild decorating the cans with the supplies above. 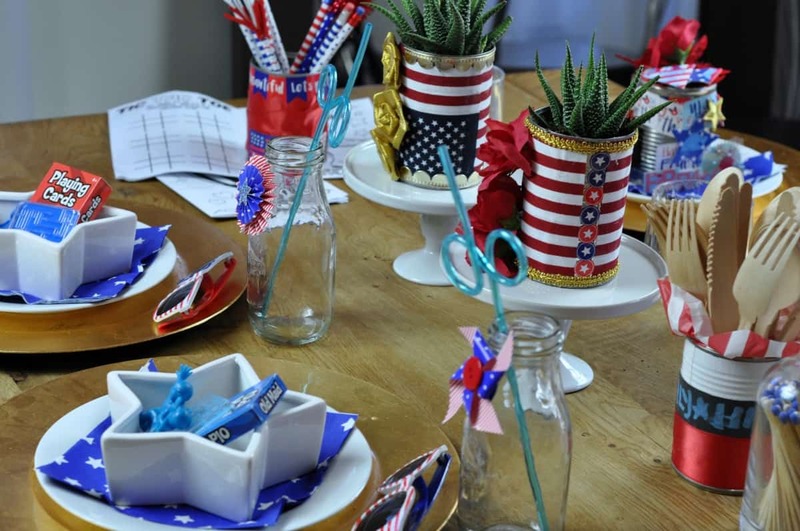 Pencil or cutlery holders – just add pencils or cutlery! 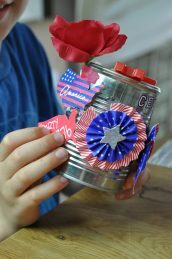 Place setting centerpieces – this is the basic decorated can but with a name label added; the kids made one for me and one for my husband and filled them with treats! 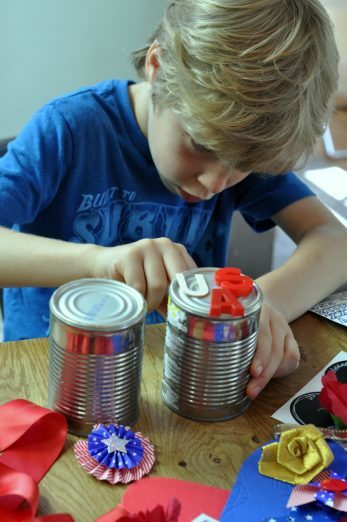 Next the kids can create the games they can play on the day – follow steps 1-2 above and then here are the following steps to create each of the retro games my husband & I remember from our youth. Our family has an old cord phone attached to the wall at home. It doesn’t work anymore but it entertains the kids endlessly. They don’t understand why or how you would use it – especially since it doesn’t play Minecraft! 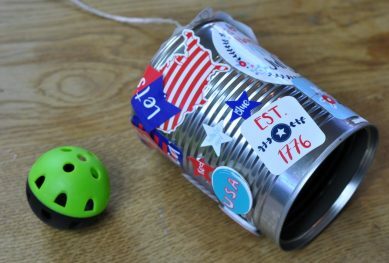 So my husband & I thought we would take a step further back in time and show the kids how we used to communicate with our friends at summer. 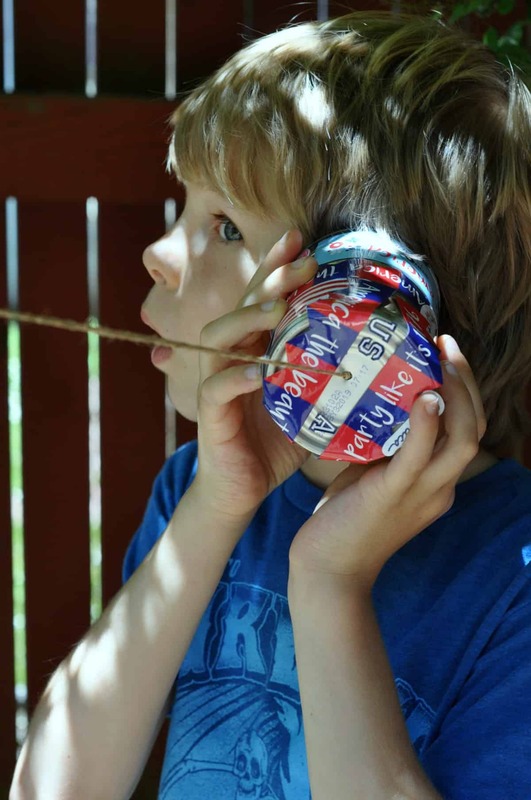 I still remember tin can talks with my neighbour next door and they were awesome for tree house to ground communications! 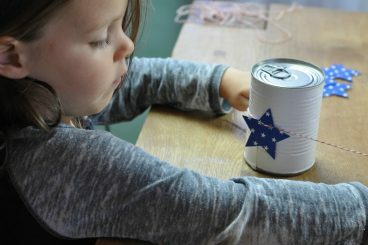 We showed the kids how easy it was to make tin can phones work, their faces were priceless! 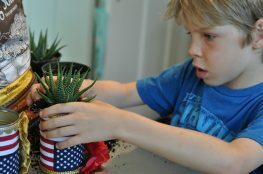 Tip: Keep that string tight/taut & don’t let it touch anything! 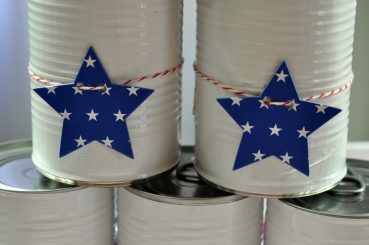 Step 3: Take 2 tin cans and punch small holes in the center of each of the tops of the cans. 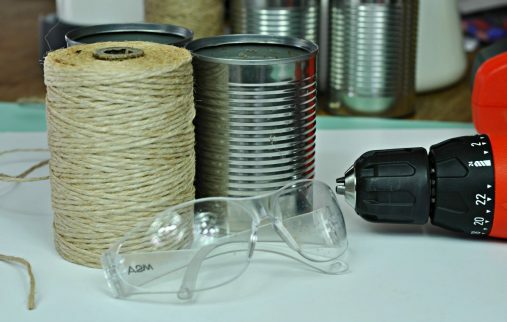 To do this you can either use a drill or a sharp screwdriver and a hammer. Step 4: Measure out the length of string, your choice but between 30-90 feet is great, we just measured out between the front and back yards. 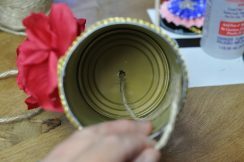 Step 4: Thread string through both holes, one end in one can, the other end in the other can. 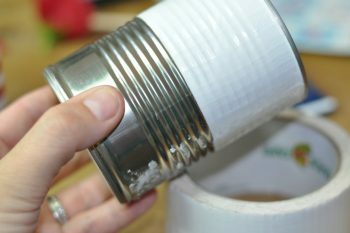 Push it through the outside/top of the can and tie the ends of on the inside if the can. 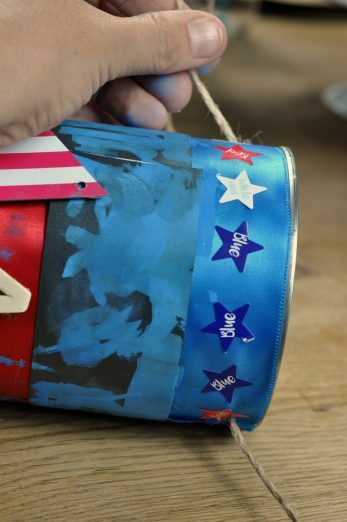 Tip: Tape over the ends of the string to narrow the string to make it easier to thread through the holes. 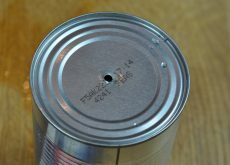 Step 3: Take 2 larger size cans and punch small holes on opposite sides of the can near the top (place at the end where the lid of the can still remains NOT the end where the lid was removed). 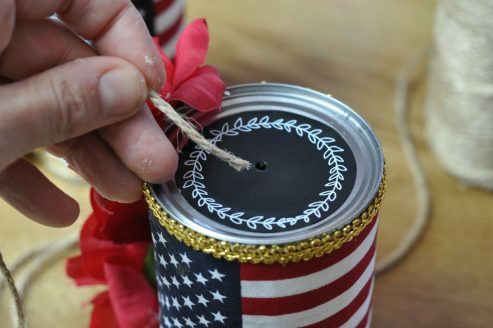 To do this you can either use a drill or a sharp screwdriver and a hammer. 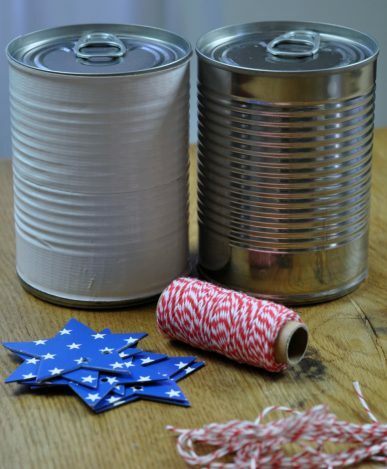 Step 4: Measure out the 2 lengths of string, one for each can. 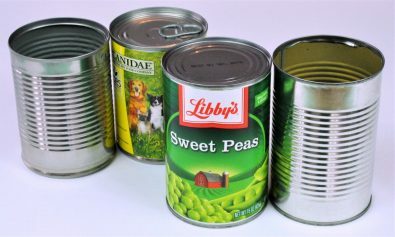 Length will depend on who is standing on the cans. 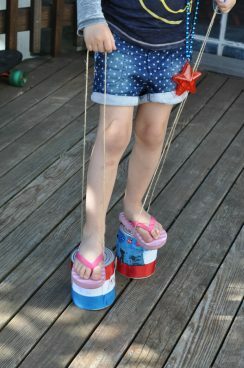 I got the kids to stand on top and measured the height from the kids feet up to their waist (so they could bend their arms and pull tight on the string to help them walk). 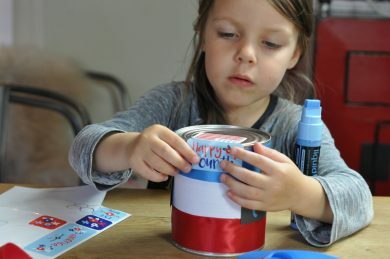 Then I doubled the length and added the can width so it allowed for the string to come up each side, creating a loop they can hold. 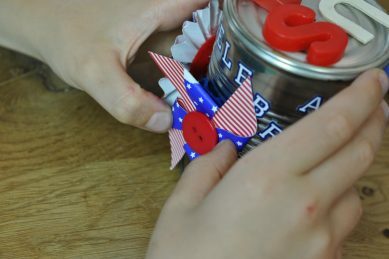 Step 4: Thread the string through both holes and tie off at the top. 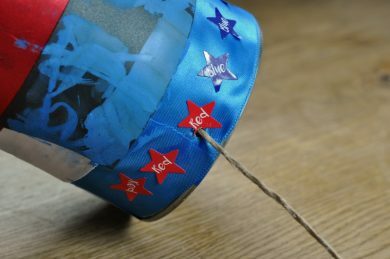 Tape over the ends of the string to narrow the string to make it easier to thread through the holes. 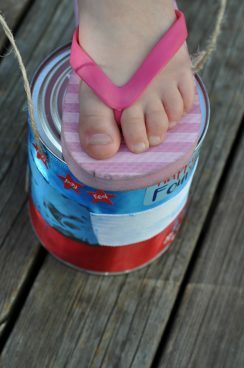 Step 5: Help the kids onto the cans, then holding one string in each hand they need to lift the can at the same time as moving their foot. It may take a couple of tries before they get used to doing it themselves, but before you know it they will be racing! 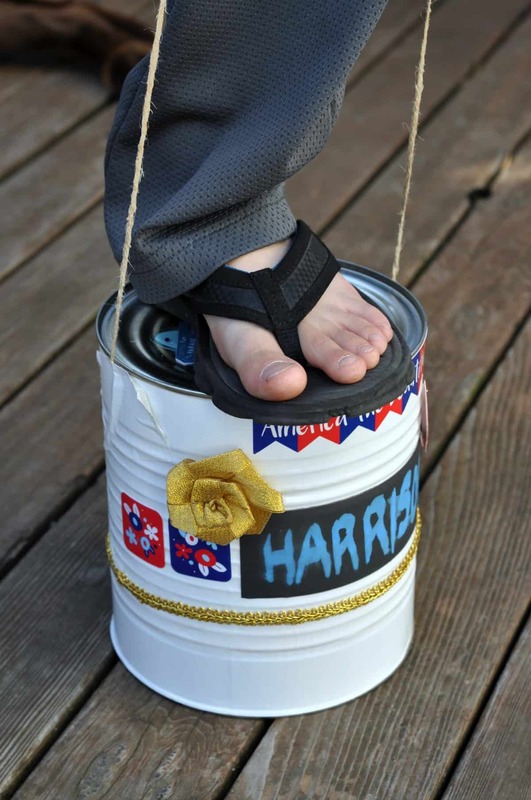 Tip: Use larger size cans for this activity to fit little feet! 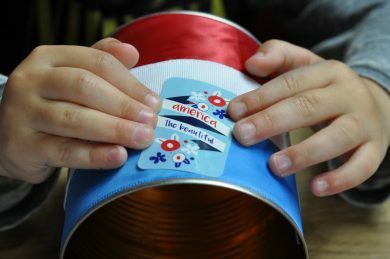 Step 3: Take a tin can and punch a small hole in the center of the top of the can. 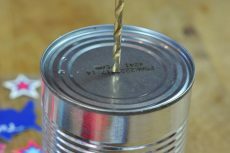 To do this you can either use a drill or a sharp screwdriver and a hammer. 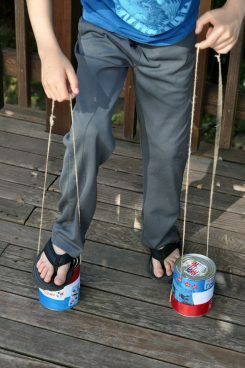 Step 4: Measure out the length of string, your choice but between 1-2 feet, the longer it is the more challenging it becomes. 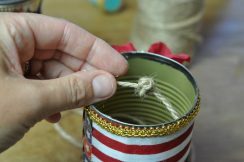 Step 5: At the end of the string attach a ball that will fit fairly comfortably into the can. 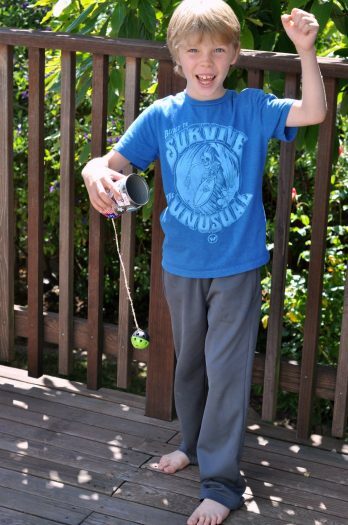 I used lightweight practice golf balls that have holes in them so are easy to tie onto the string. 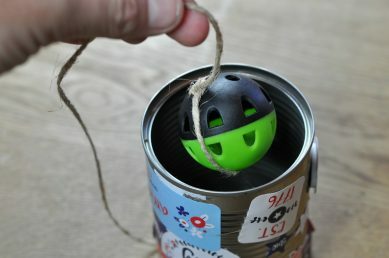 If you only have a ping pong or rubber ball you can put a hole in it and screw in an eyelet screw that the string can easily pass through to tie off. 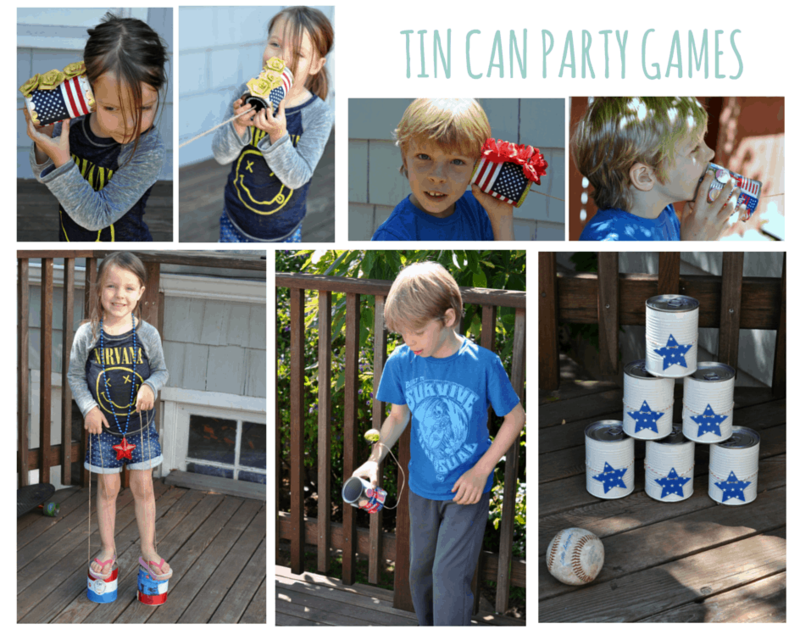 Step 6: Get your children to try and swing the ball up in the air and catch it in the tin can. Most catches in a row wins! This leads to competition every time! 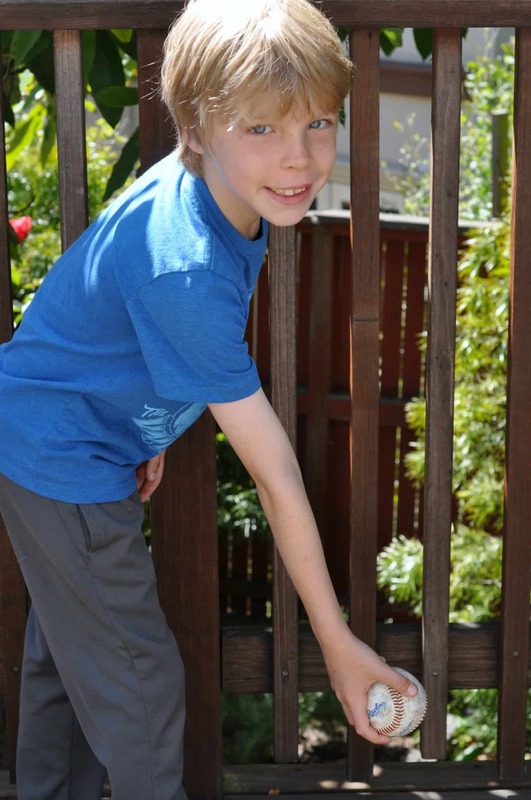 Step 4: Give the kids a tennis ball and a marker to stand behind and get them to try and knock the cans down, just like they do at carnivals….only it’s possible! Put the pyramid on a cake stand to add to the challenge (all the cans must be knocked off the stand to win). 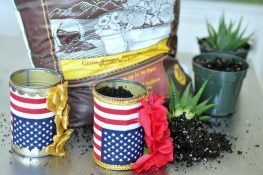 Here are some other fun DIY’s if you are having a party this summer; a photo booth and prop bar perfect for a luau or tropical get together and yarn craft flower fun the kids can do too. Thank you for having me over today!! I would love a follow on Fern & Maple’s Social Media!! I’m a blogger, party & brand stylist, crafter, event planner & “handler” of a Canadian husband, USA /Aussie born kids & a choc lab Elsa. My blog is the life of a New Zealander living abroad and bringing the party with her!